Accurate high-quality body routing templates are a crucial tool in a luthier's arsenal. A perfect template guarantees a perfectly routed body. The first thing to keep in mind when building a template is to ensure that you have a full-scale drawing/blueprint of the guitar you wish to make templates for. There’s nothing worse than making a template only to find out it won’t work for you… or even worse, building the guitar from that template! So check, and recheck all your measurements and drawings to make sure you’ve got it all right. To build a quality template you’re going to need a couple of tools and a short list of materials. For the actual templates you’re going to need 1/8” thick hardboard, and ¾” (1/2” also works, but I prefer the thicker variety) MDF. Both of these materials are relatively cheap at the home depot or Lowes. As for the tools, you’ll of course need a pencil, ruler, marker, oscillating spindle sander or drum sander chucked into your drill press, some sort of saw; be it a jigsaw, coping saw, or the best, a scroll or bandsaw, a palm sander (square pad will work better for this than an RO sander), and lastly a router preferably with a table. The first step is to get the sharp of your body from your drawings onto the 1/8” hardboard. This is easily done by cutting the shape out from your blueprints (always make sure you have a non-cut up copy! You can copy things this large at a FedEx Kinkos) and then trace it onto the hardboard with your pencil, centering it along the center line you have already drawn with your ruler (center lines are KEY to guitar building!). Since the hardboard is a relatively dark material the pencil may be hard to see well enough to follow, so now go over this line with your thin tipped marker in a nice easy to see black line. You may now roughly cut out the shape using the saw device of your choice. Try and keep as close to the black line as you can without going into it (leaving about 1/16” off the line should be close enough for this step), because you can always later remove material you failed to cut away, but you can never add back material that you took off inside the line. You should now have a rough shape for your body, but that obviously still needs a little work. The next step will be to perfect the shape with sanders. Start the sanding process by using the OS Sander or chucked drum sander to work at creating a continuous, perfectly flowing curve on all of the concave sections of the template. It’s generally a good idea to keep the template moving along the curve instead of sitting and sanding it in one place, which will cause a depression. 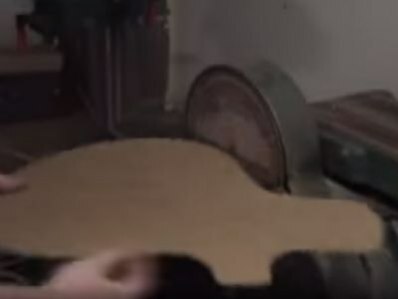 The only time you should sand an area without moving is if you have a large lump that needs some serious bringing down to level with the curve. This constant motion while sanding will help to perfect the curve and make it smooth and continuous. The best way to find out if you’ve accomplished this is by holding the template up to, and covering the sun, or a light, so that the light comes in around the template and gives you a starkly contrasted profile which allows you to see the state that the edges of the template are in much better than simply looking at them normally. Keep in mind, even the slightest imperfections on your 1/8” template will come out to be large noticeable ones when they are compounded by the 1.5”-1.75” thickness of the guitar’s body the template will make. Once you are done and happy with the concave sections of the template, it’s now time to focus on the convex sections. For this we will use the palm sander. The reason for this is because it has a flat bottom surface, meaning it will sand off all high spots, but since it’s flat and the surface is convex, it won’t further sand lower and of the low spots, ie: you’ll end up with some nice uniformity. Using the same process of checking your progress with light profiles, sand the convex sections until they too flow perfectly and you are happy with them. Now take your 1/8” hardboard template and trace that onto a piece of ¾” MDF with a centerline. Then once again roughly saw out the outline, this time you don’t have to be nearly as accurate. Then, using double sided tape, nails, whatever you have around, secure the 1/8” template onto the rough cut ¾” MDF one. We will now use a bearing guided bit with your router table to copy the exact shape of the 1/8” template to the ¾” one. Keep in mind this may take several passes because ¾” is quite a bit of material, even though MDF cuts like butter on a router. Now you might ask, “Why did I got through the whole process of hand creating a template in the 1/8” material, just to end up using it only to create a ¾” one! ?” The answer is simple. 1/8” thick material is much easier to shape by hand and with simple tools. Also, since the material is thin, even if you sand the edge at an angle, or some other mistake, since the bearing on the router is thicker than the material, it will follow only the high parts, in essence, negating these angled sides/mistakes. Whereas, if you had made the same mistake on a hand done ¾” template, since it’s thicker, and mistake over its thickness will have a greater impact than that of the 1/8” material. This is easily explained with right triangles. Lets say you accidentally sand the edge at a 3-degree angle. 3 degrees over 1/8” is really a negligible difference on the side of the triangle opposite the angle. However, the same mistake done over a triangle of base length ¾” will result in a much larger error, one that could easily be large enough, when transferred to your guitar body, to make a flat spot, or an imperfect curve, or any number of visual unpleasant features. As for the reason for needing a ¾” template at all and not just using the 1/8” one to route the body; since the body will be some 1.5”-1.75” thick you’ll have to route in several passes and thus the bearing will go up in height each pass, and therefore you’ll need a thicker template to accommodate for this so that the bearing will always have a surface of the template to follow. Follow the same above steps to create your template for the headstock shape. The final template that you’ll need to create is the template for your neck and fretboard. The good thing about this template is that if you build the template for the neck, you can also use it for the fretboard. Simply find the width of the neck at the nut and at any point further down the neck, say something like the 12th or the 24th fret for convenience, and then take a perfectly straight piece of wood (often the edges of the MDF when you buy it are straight enough, so cut off a strip or two) and using strong double sided tape, tape this straight piece along one edge of the taper you’ve drawn out between the nut and the point you chose further down the neck. Use this straight piece and a template bearing guided router bit to route along it, then repeat for the other side of the fretboard taper. Now you should have the perfect taper for your neck and fretboard. It’s now time to cut off the extra wood where the nut will be, and also down where the end of your neck tenon will be. If you want to route your neck pocket with a router, you should round off the ends of you template down where the tenon end is at the same radius as the bit you plan to route the neck pocket with for a nice tight fit. You can use this whole template to route the entire neck (in conjunction with the headstock template you’ve made) or to route just the fretboard by positioning the fretboard wood at the nut and centered. Keep in mind, the straight wood/bearing bit method can be used for a great number of things such as routing the perfect control cavity, or even more complicated routes like a neck pocket, which can be done by clamping the neck where you want it, and then taping straight pieces on either side and at the end of the tenon. The Comprehensive Guide To Body Template Making by Chris Verhoeven is licensed under a Creative Commons Attribution-NonCommercial-ShareAlike 4.0 International License.